Head lice live among the hair present on the human head and are adapted to living mainly on the scalp and neck hairs of their human host. Lice present on other body parts covered by hair are not head lice Description The adult head louse resembles a miniature ant that appears flat . 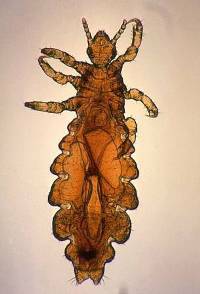 Head lice have a head, thorax and abdomen with six legs, but their two front legs are very large in order to grab onto the hair shafts. Head lice are tan to greyish-white in color.Life cycle Lice eggs on the hair very close to the scalp are the primary sign of an active infestation. A female can lay up to 50-150 eggs in its life, but it can lay up to 100 eggs in 30 days. She also glues her eggs, sometimes called "nits", which look like tiny white beads, to hair shafts very close to the scalp (usually about a centimeter or two [half an inch to three-quarters of an inch] from the scalp). Eggs are very small, about the size of a period "." (full stop) in normal printing. Eggs may appear white, yellowish, brownish or greyish, but are almost always lighter colored. An egg normally undergoes a 7-9 day incubation before hatching as a baby nymph. It can be passed to adult to child or child to adult. Head lice have no wings and move primarily by crawling. 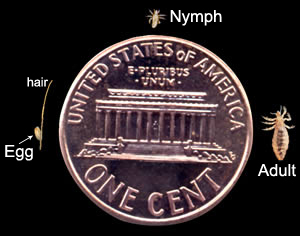 They have no adaptations for jumping.There are three main stages in the life of a head louse: the nit, the nymph, and the adult. Nit: Nits are head lice eggs. They are hard to see and are found firmly attached to the hair shaft. They are oval and usually yellow to white. Nits take about 1 week to hatch. Nymph: The nit hatches into a baby louse called a nymph. It looks like an adult head louse, but is smaller. Nymphs mature into adults about 7 days after hatching. To live, the nymph must feed on blood. It metamorphoses 3 times before it reaches the adult stage. Most head lice at this stage are almost transparent until they have eaten (sucked blood from a human skin). Then they can be seen more easily since it will be possible to see the tiny amount of red or brown blood in their stomach. To the unaided eye, it will appear like a small red dot usually about 0.5 mm or less in diameter. With a magnifying glass or microscope it is possible to see the head and legs, and since a louse is quite transparent at this stage, the digestive system, showing the blood that was ingested. Adult: To live, adult lice need to feed on blood. Females are usually larger than males, and can lay several nits in a day. If the louse falls off a person, it usually dies within 1-2 days , although experiments have shown them to live longer. A female may continue to lay eggs on other materials similar to the texture of human hair such as stuffed animals with long strands of hair. The most common symptom is itching of the scalp, caused when the louse bites through the skin to feed on blood. The lice themselves are essentially harmless, although excessive scratching may cause bleeding of the scalp, which may increase the risk of microbial infection. Separate and clip the hair up into four sections and start combing, stopping to wipe the lice and eggs on a towel every few strokes. Continue until all the sections are done.Repeat, wash the combs, and start again. You should comb through the hair until not a single egg or nit shows up! This will probably take an hour or so.Pour a cup of vinegar into a pitcher of water. Vinegar is also supposed to help loosen the eggs. Wash the hair out with the vinegar rinse and then with water.Clean all of the infected person's contaminated belongings: clothes, towels, and bedding will need to be washed in hot water, and their mattress and room vacuumed thoroughly. Use the hottest setting on the dryer and dry for the longest time you can without harming the fabric.Wait a day, and then repeat the process, sitting down, putting in the conditioner and combing through the hair. You could be surprised after the last comb-through that the little parasites are back; although if they are, they should be back in greatly decreased numbers.Again, comb through the hair until not one of the lice shows up. Repeat again. And again. And yet again. Usually two weeks will pass until all the lice are gone. You can douse the hair in olive oil or mayonnaise, which dissolves the exoskeletons of the lice and their nits. Wrap the hair in a plastic bag and let set for 4-6 hours. You can also try a 50-50 solution of mineral oil and vinegar.You may want to wash the hair with dish soap instead of regular shampoo because it will more easily remove the oil and vinegar. To eliminate head lice and head lice nits shower and clean with herbal soaps such as tea tree oil shampoo and then rinse the hair with full strength vinegar. Natural apple cider vinegar is the best choice. Shaving off all the hair is a viable solution. This can be performed alone using mirrors to see all sides of the head, although it is easier to have someone else help with the procedure. A completely shaven head is necessary, a mere buzz cut is not sufficient.Shaving the head gives the lice little to grasp to stay attached to the head. In addition to head hair, lice may infest facial hair or eyebrows, and these may also need to be removed for effective treatment.While effective, some patients may find the hair removal aesthetically unappealing.